Whitening Toothpaste with Fluoride brightens teeth 273% more effectively than the leading national brand.  Whitens: Calprox® safely lifts surface stains such as coffee, tea, tobacco, red wine, and other stains without harsh abrasives or the risk of sensitivity. Maintains and enhances the vibrancy of professionally bleached teeth. Restores bonding, caps, veneers, and dentures to their original whiteness.  Freshens: Sodium Bicarbonate provides long-lasting germicidal protection for fresher breath.  Strengthens: The combination of calcium and phosphates re-mineralizes tooth enamel.  Protects: Fights against cavities with fluoride. For best results, place a pearl size drop of Whitening Toothpaste on a dry toothbrush and brush in a circular motion for two minutes twice daily. Removes superficial stains such as those caused by coffee, tea, tobacco, red wine and leaves teeth glistening and noticeably smoother? ?without harsh abrasives. The Whitening Toothpaste incorporates the breakthrough science of Calprox??? ?Supersmile's proprietary form of Calcium Peroxide that is encapsulated with baking soda? 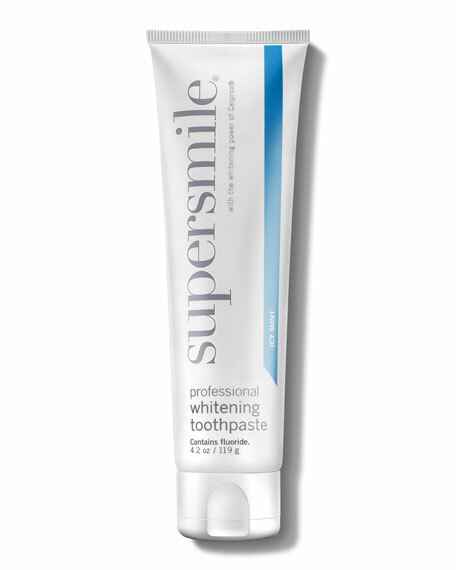 ?with 16 other ingredients to provide superior whitening.